As every food lover in town surely knows by now, Boulder has in the last few years become a proving ground for inventive pizzerias cooking pies the old fashioned Neapolitan way, in a scorching hot wood-fired oven, with thin crusts and fresh toppings. Passionate about the alchemical combinations of crust, cheese and toppings that make authentic Italian-style pizzas such a wonderment (not to mention the longstanding challenge of crafting quality crusts at altitude), these establishments have put all their considerable culinary talents and financial resources to making world class pies. Boulder is the happier for it. 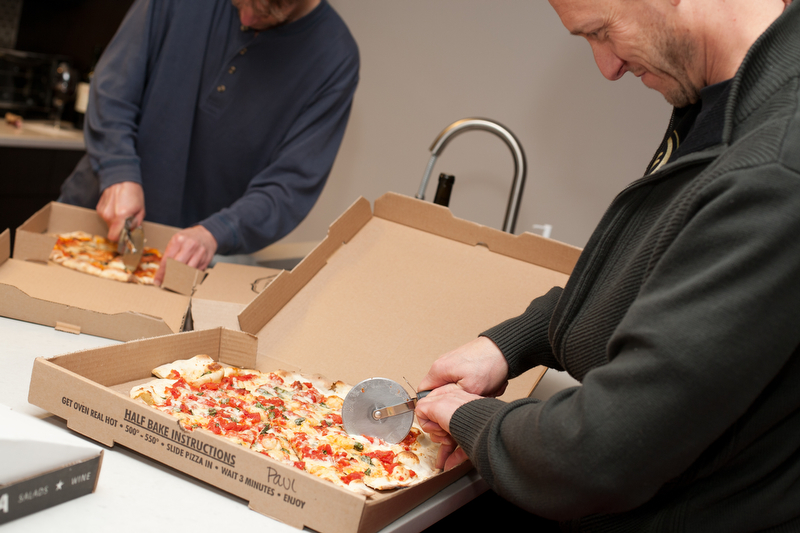 With such a luxury of riches to sample, we here at EDB decided to turn our inaugural staff kick-off party into an Artisanal Pizza Contest. 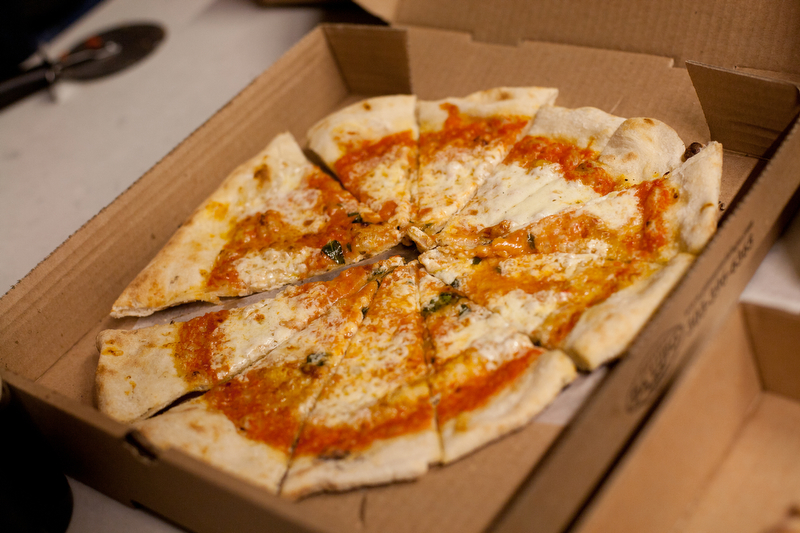 Which of the great pizzerias in town, new or old, makes the best pie? From the start we recognized that it’s a loaded question: pizza elicits such strong personal reactions, often drawn from our deepest, dearest childhood memories. And with several top notch contenders vying for the title, the stakes were high. Nevertheless, despite the risk of having our first meeting devolve into foodfight and fisticuffs, we dedicated ourselves stomach and soul to answering this delicate, delicious question. Our ground rules were simple, and limited contenders to a manageable seven: we only sampled pies that were cooked in an Italian style (wood-fired) oven, made in the classic Italian, thin crust, single-serving style. We ordered a simple margherita pizza from each (tomatoes, basil and mozzarella), then gathered at our secret EDB lair in downtown Boulder and got down to business. Each pie was rated on looks, crust, cheese, sauce and overall quality. Aware that all these pizzas shine brightest when eaten straight out of the oven, we coordinated pick up times just before meeting, so all were sampled under the same conditions. The establishments we tested featured two longtime Boulder mainstays (Proto’s in North Boulder and Laudisio’s in 29th Street); three celebrated entrants from the artisanal pizza boom of late 2010/early 2011 (Basta, da Lupo, and Locale); a young, yet pedigreed, operation that arrived late last year (Tossa), and finally, a bit of a wild card, the pizza counter at resurrected Boulder natural foods mecca Alfalfa’s, who do use a wood-fired oven and thus passed our entry requirements. Once we cracked the pie boxes, all the getting-to-know-you chatter subsided and the crew took to tasting and rating in earnest. Each of the judges brought their own unique experience to the challenge: Christy, hailing from the northwest (farthest from bella Italia) has recent (we trust) fond memories of her nuptials there last year; her bar was high. Sara and Marsha, professional photographers, were especially attuned to the plate presentation, but were unforgiving in their taste assessments. (Screw up their pie and they will make you look silly, girlfriend.) Holly, recently returned from menu-consulting in the Middle East, was happy to have pizza of any kind, although her dietitian instincts and sophisticated palate kicked in immediately. Shannon let out her inner French philosopher-gourmand and deconstructed each pie with inspired acumen. Allan, who has been biking and eating his way through Italy for a decade, had a wealth of native examples for comparison. He rated the wares across the board surprisingly highly: a testament to the overall quality of product in the Republic. Finally, LV Torio and yours truly had to suppress fond memories of Sally’s and Modern Apizza in our hometown of New Haven, not to mention our Campania-blooded nonni’s fried dough “pizzas” — both very different beasts from the Neapolitan-inspired classics we were eating. Overall: 1. Locale, 2. Proto’s, 3. Basta. The results were decisive: Locale won the overall rating by a wide margin. It is perhaps not a surprise that Locale swept top honors, with their imported cheese, wheat, toppings, prosciutto slicer, and (who knows?) ground water. They have a clear vision for each pizza, their cooks are well trained, and they bring deep care to their constructions, which comes through in the taste. Proto’s, proudly out-pointing most of the new kids on the block, can stand tall knowing they are still riding atop the wave they helped usher in a decade ago. And Basta, only slightly less heralded than winner Locale, is well-deserving of their medal showing. Our judges were unanimous that their sauce is especially brilliant, making a trip to the Peloton mandatory. We should mention that Laudisio’s and da Lupo suffered from split opinions. Each had their strong advocates, but equally opinionated detractors. You should taste their wares yourself in the event you are among the sizable contingents who love them. We found the pizzas from Alfalfa’s and Tossa to be something other than the traditional Italian style, whether it was ingredient or proportion, and it resulted in their downgrading across our panel. If you have a comment on the proceedings, we’d love to hear from you. If you are from one of the establishments we reviewed, and would like to laud or dispute our findings, please leave a comment here and let us know where we got it right or screwed up.